For some reason, I began watching one of my sermon videos this evening from the Sunday after Christmas. While I usually like to review what I do in an effort to be a better communicator next time, I rarely go back months later and watch it again. But tonight was different. As I began to watch myself walk nervously across the stage and introduce myself to the congregation, I actually started listening to the content, not just noticing the way the words were being presented or the way I move my hands in a predictable pattern when I talk. And what I heard struck me in a powerful way, almost as if I had never heard this before (even though I was the one who said it). There is a theme in the story of Jesus’ birth that doesn’t get touched on in many advent seasons. It’s not a sermon that is heard on Christmas Eve. Come to think of it, it’s not even that much of a Christmas-y thought… But, nevertheless, there it is. Throughout the story of Jesus’ birth, it’s there. When Mary became pregnant, she had to release control of the life she thought she was going to lead. When Joseph heard about the baby, he had to release control of his pride and stand alongside Mary in this confusing time. When it came to the census, they both had to release control of the comfort of home and travel to Bethlehem, a 3+ day journey in the heat. When there was no room for them at the inn, they had to release control and place their newborn son in a feeding trough. They had to release control when shepherds invaded the delivery room, smelly and loud. And again, they had to release control when a stranger picked up Jesus and started praising God in the middle of a busy temple while trying to exercise their religious routine. I’m sure that Mary and Joseph learned early on that control goes out the window when dealing with God; trusting him with this pregnancy and this child. Not a Hallelujah Chorus or a “no crying he makes” baby. No, this is real. This is powerful. This is God showing the world that when His will be done on earth as it is in heaven, He has got to be the one in control. And when we try to gain control, we only get in the way. Just an interesting thought on a random night, but one that continues to be powerful and relevant over and over again. 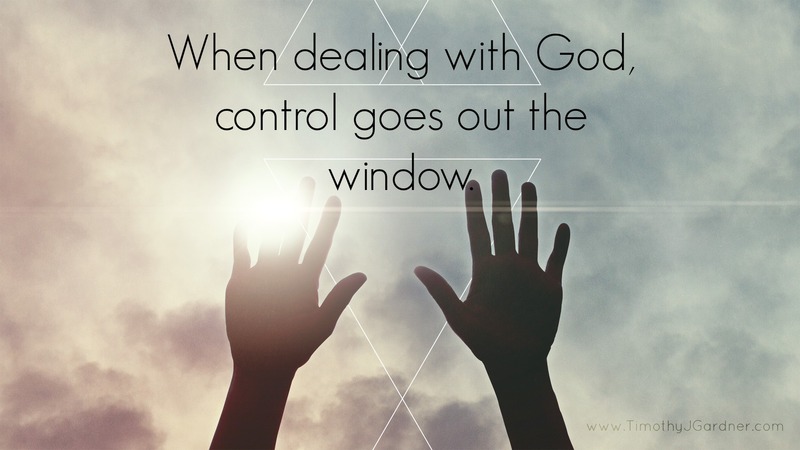 Lord, help me to let you control in a way that only you know how. Amen. This entry was posted in Christmas, God and tagged Christmas, Sermon on May 13, 2014 by tgardner7. There are those who witnessed the birth of Jesus firsthand. They were there at the very beginning. I’m not going to talk about them. It’s common to focus on the center-stage, first string characters. Instead, I’m going to take a look at the perspectives of those who were off stage for most of the story, those who were on the sidelines. Elizabeth is probably the first in the string of characters in the Christmas story who was on the sidelines. 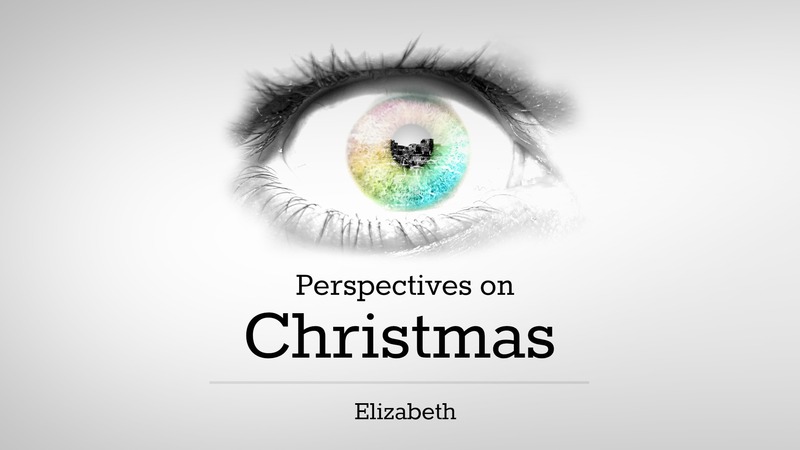 Elizabeth, even though she wasn’t present at the actual birth of Jesus, has a unique and valuable perspective on the arrival of God in the flesh. I’m not going to type out the Zechariah/Elizabeth story, so I need you to (1) stop reading, and (2) open your bible to Luke 1 and read verses 1 through 45. If you don’t have a bible, read the story HERE. Really, go read it, it’s worth it. (1) The narrator tells us that Zechariah and Elizabeth were both “righteous in the sight of God, walking blamelessly in all the commandments and requirements of The Lord” (v. 6). This is hugely important. Elizabeth was not able to conceive, and in that day, this would have pointed to a problem between the couple and God. It would be a moral or ethical failure, a problem of sin, or some other reason why God would be displeased with them. However, the detail found in verse 6 tells us this isn’t the case. They were in a right relationship with God. Imagine what Elizabeth would be feeling. She’s old, and her entire life she has remained childless. I imagine she routinely cried out “Why God?” Her prayers may have sounded like Psalm 13, expressing sorrow and pain. But, like in the psalm, she probably always ended her prayers with trust and faith that God is in control. While she couldn’t see God at work in her life in this area, she and her husband remained faithful and remained in a right relationship with their Father. Talk about faith! (2) Gabriel, the angel who appeared to Zechariah in the temple, said “your petition [or prayer] has been heard, and your wife Elizabeth will bear you a son” (v. 13). Wow. Elizabeth and Zechariah probably spent years before God, praying and asking God to give them a child. Even though God seemed absent and silent, they had not stopped remaining faithful in prayer. (3) After so many years of waiting, so many years of wondering where God was, yet remaining faithful to God’s ways and God’s instruction, Elizabeth became pregnant, just like the angel said. And her first reaction to this is key: “This is the way the Lord has dealt with me in the days when He looked with favor upon me, to take away my disgrace among men” (v. 25). She is filled with joy and rightfully attributes this blessing to God, knowing that God has provided. God saw her and her husband and had a plan for them all along. In verse 43, she exclaims, “And how has it happened to me, that the mother of my Lord would come to me.” She realizes her and Mary’s parts in God’s story of bringing a savior, Jesus. God had not ignored her, and had plans to use her for His purposes, for His story. There’s Elizabeth’s perspective. Most of her life was marked with barrenness and emptiness. But she was faithful in the midst of that hardship, joyful for God’s provision, and thankful that she was able to be used in God’s big story of redeeming His people. Where are you in this story? Are you experiencing hardship, wondering where God is? Are you able to remain faithful in these times? Elizabeth’s initial response was joy and thankfulness as she rightfully attributed her child’s conception to God. What is your response to God’s blessings? Does your obedience to God ever depend on what you receive from Him? Are you able to notice how God wants to use you in His story of redemption? Father, as we continue through this Christmas season, help us to look to you and find you, notice your blessings in our lives, and respond with joy and thankfulness when you work in our lives. Amen. This entry was posted in Christmas, God and tagged Christmas, Jesus on December 6, 2013 by tgardner7. Christmas is over… Happy New Year! It’s easy to be caught up in the end of Christmas, as sad as that sounds. Christmastime goes even quicker than it comes with the start of the new year: new years resolutions to accomplish, a new semester to dread, new teachers to impress, new chores to leave until the last minute, etc, etc. With this time of newness and fresh starts, it’s easy to move on too quickly from the story of Jesus’ birth, especially since his birth is celebrated year after year like just another holiday on the list. But what if we didn’t treat it like any other holiday and move on so quickly from it this year? What if we took a second look and responded to Jesus’ birth appropriately? Take a look at Luke 2 (Jesus’ birth narrative). We see that different people all responded differently to the birth of Jesus, all appropriate and all acceptable. The shepherds – “When they had seen him, they spread the word concerning what had been told them about this child… glorifying and praising God for all the things they had heard and seen” (Luke 2:17, 20, NIV). The shepherds became instantly evangelistic. They met Jesus, saw the King, and wanted the world to know. Mary – “But Mary treasured up all these things and pondered them in her heart” (Luke 2:19, NIV). Mary took a more contemplative approach, treasuring Jesus’ birth in her heart. Simeon – “praised God” (Luke 2:28, NIV). Simeon, after years of waiting for the Messiah, praised God through song and prayer. Anna – “gave thanks to God” (Luke 2:38, NIV). Anna, a prophet waiting for the Messiah almost her entire life, thanked God and spread the news of redemption to all who would hear. How are you going to respond to Jesus’ birth this year? Spread the good news of redemption like Anna and the shepherds. Spend time with God through prayer and meditating on God’s truth like Mary. Praise God through song and prayer like Simeon. This event is too important to gloss over like any other holiday. This entry was posted in Christmas, God and tagged Christmas, New Year, Reflection on January 7, 2012 by tgardner7.